KryptonZone Blog: Stealing the FIFA World Cup Trophy? 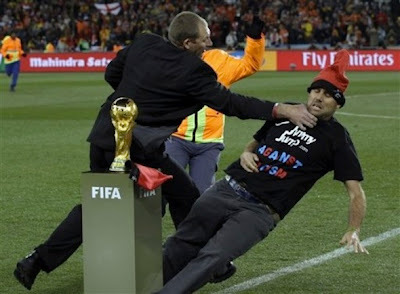 Stealing the FIFA World Cup Trophy? As the big game was about to start today, while the players were still in the tunnels, I was thinking: why does no one just run onto the pitch and grab the World Cup Trophy? The gleaming Trophy was sitting on a plinth in the middle of the pitch with absolutely no-one within striking distance to guard it. If you were watching the match, you would have seen that the players in the tunnel were hurriedly asked to shift to the right and make way. Well, it was a space for a pitch invader, who actually tried to get to the Trophy before the match, to be whisked away. 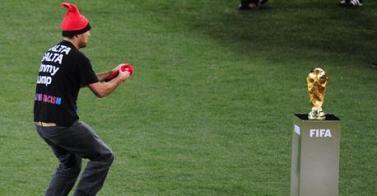 Apparently, reports suggest he was trying to put a hat on the trophy. While he was about arm length to the Trophy, the security guards finally caught on and exercised that age old, banned, tradition of a rugby high tackle to take him down. 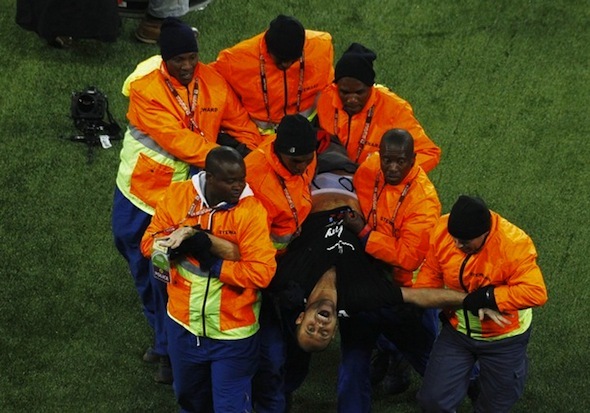 It took no less than 7 other personnel to remove him through the tunnel. Fantastic! Pity it didn't make it onto the TV. Oh yeah... It's currently 70min into the game, and it's still 0-0 with some pretty good chances. Best one coming about 30 seconds ago by David Villa.